Matthew Cunningham-Cook was a Nation intern in the summer of 2012. An activist and reporter in the labor movement, he has worked with Labor Notes, AFSCME, and the UAW. Should decent wage jobs be considered an unnecessary burden or a critical part of a civilized urban metropolis? 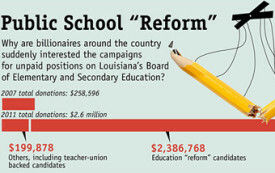 Why Do Some of America’s Wealthiest Individuals Have Fingers in Louisiana’s Education System? The extremely wealthy are out to destroy public education, and reap the benefits. 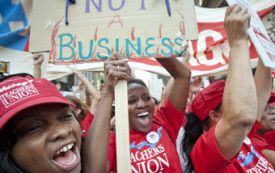 Teachers in Chicago realize that they are striking a blow for the preservation of public education across the country. In Chicago, teachers aren’t just fighting for a fair contract—they’re fighting to stop the education reform agenda that dominates the national debate. 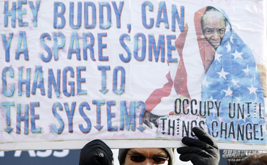 At a time when 4.5 million Americans make at or below the minimum wage, a broad coalition unites to demand better pay. 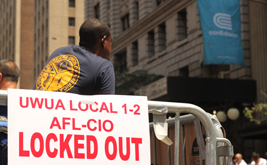 As a hot summer rolls on and the lockout enters its third week, New York City unions ramp up the pressure. Days after being locked out, the utility company’s union workers show that they’re not going down without a fight.